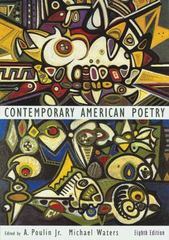 Contemporary American Poetry 8 Edition This highly respected anthology presents the works of 70 poets who have shaped the contours and direction of mainstream American poetry from 1960 to the present. Designed to provide a rich reading experience for both undergrad and graduate courses, more than 500 selections illustrate the variety and vitality of American poetry over the last few decades. For each poet, the collection features a generous sampling of their work along with a photo, biographical sketches, and bibliographies.